Formed in Messina, Italy, a decade ago, BUNKER 66 is a Black Metal band with Speed Metal leanings. That means, what you hear is a brilliant mix of dark Metal at Speed Metal pace. The band got together to play the music they loved and a brainstorming session led to the name BUNKER 66, narrowly avoiding the 666 cliché in Metal music. The album is their third full-length album after “Infernö Interceptörs” and “Screaming Rock Believers” in 2012 and 2014 respectively. The band has released one EP and live album and two compilations and split albums. They state Punk music and Metal music as their main inspiration for the music they play. 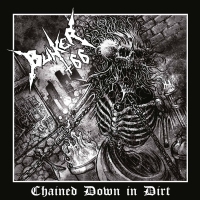 While the terms Black Metal and Thrash Metal are thrown about carelessly, BUNKER 66 thinks that the music they play can be slotted as Black Speed Metal. They can call it whatever they want, but what the listener gets is a lesson in some amazing riffs, backed by solid beats and searing guitars. The songs are short, to the point and have some amazing melodies. The gnarly, gravelled vocals add an aura of vicious intent. The album has an intense mix of Black, Speed and Thrash Metal wrapped up in a nice little vicious package. With a runtime of fewer than 24 minutes, Chained down in Dirt is an incredible all-around album. The album starts off in a Speed Metal vein with “Satan’s Countess” and the song also has some clean vocals in the latter parts as well as some operatic singing. Almost all the songs that come after is fast and doesn’t wait around and is frenetic from start to finish. The vocal style is steeped in the traditions that VENOM pioneered and TANK-esque. The standout song of the album for me is “Taken under her spell”, a song nestled smack in between the record. A trashy riff that sets the head bobbing with all the trappings of a sinister Black Metal track, this is a gem of a song. Halfway through, the song gets even faster and is complemented by a brilliant lead guitar solo. The band has explored multiple genres and the album has Black, Speed and Thrash Metal sounds. While few of the songs are mid-tempo, there are moments of pure Thrash magic. This is an excellent record and they have ticked off all the boxes with regard to speed and ferocity. The only thing that sounded a little off is the bit with clean vocals that don’t really do justice to the tracks. This is a thoroughly enjoyable album from start to finish and I would definitely recommend the album. Old School Metal with a fresh take, it is easily possible to listen to this over and over again.